I’m so excited to share my Christmas tree for this year. I wanted it to be super colorful, with a vintage feel, and an emphasis on green and blue. I’m SO happy with how it turned out. I used to struggle a lot to figure out how to make my tree look the way I dreamed it being in my head. When I actually decorated it, I often found myself feeling disappointed. Have you ever felt that way? 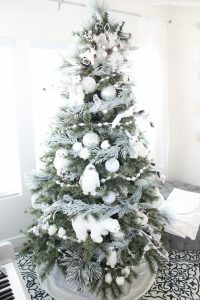 I have had friends ask me for tips and tricks on certain parts of decorating a tree, so while I’m sharing my tree I thought I would answer my three most common Christmas tree decorating FAQ’s. After a few years in a row of battling the ribbon and getting really frustrated, this was the year I finally had the hang of decorating my tree with it! I wanted to share my tips with you, in case you’ve ever been in that place too. It’s actually not hard, but there are some tricks to making it look good and stay that way. 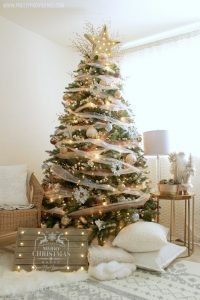 Make sure you have enough ribbon to cover the whole tree. You can use multiple rolls of the same ribbon for a clean and cohesive look, or a few different colors. I used three different ribbons on this tree, as well as silver mylar garlands. Cut the ribbon into smaller pieces. I cut mine into pieces about 3 feet long. Use thick wired ribbon. You will have greater control over how it lays. Use floral wire to gather your ribbon and secure it to tree branches. I found the teal velvet ribbon at Michael’s this year, and I had collected the white and green ribbons during after-Christmas clearance at Joann last year. Wired ribbon can get pretty expensive, so buying it on clearance can save a ton of money! I also had the silver garlands from the Mid Century Modern tree I did a few years back. Put your tree in a corner or somewhere that you can block off if you need to. Use shatter-proof ornaments only. I know this is hard to do, but it’s getting easier. The stores sell more and more colors every year. It’s worth it not to have to worry about your baby or toddler being hurt by broken glass. 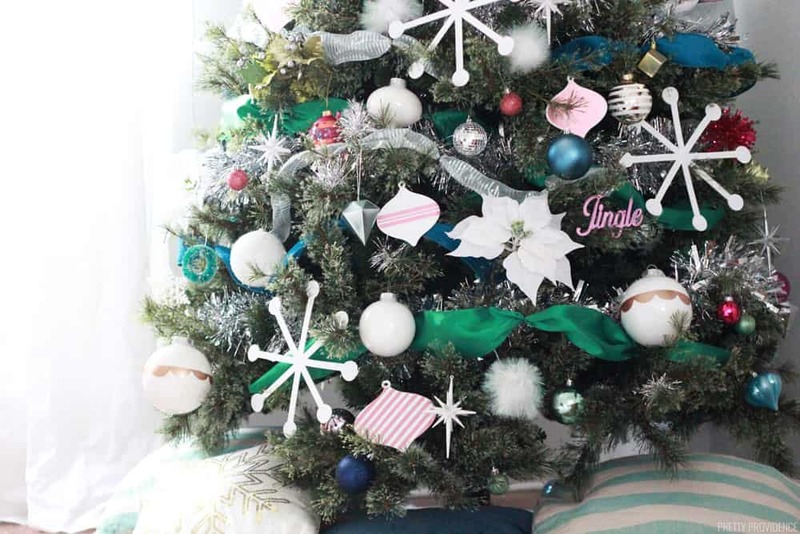 Make your own ornaments like these chipboard ornaments, or paint clear plastic ornaments in whatever colors you love. 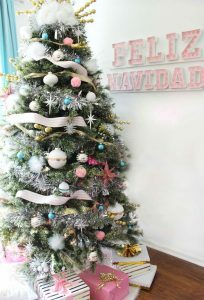 Use floral elements like oversized poinsettias, or even stuffed animals, like Jess did in this Winter Wonderland tree! Use floral wire to secure ornaments and ribbon to your tree so they can’t be easily pulled off. Keep the lights and cords hidden and inaccessible to toddlers. We have kept our tree in a corner of our family room with our couch and loveseat on either side of it. When we need to, we can push our ottoman in front of the tree so that the little ones can’t get to it. We also used our play yard around the tree a few years ago to keep a crawling baby away from it. It didn’t look as pretty with the fence around it, but at least everyone was safe and we could breathe easier! 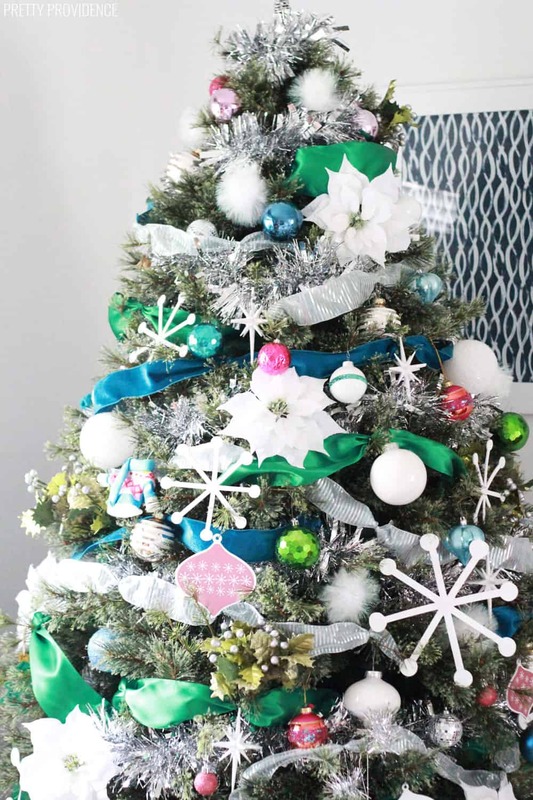 I can’t tell you how many times I have heard someone say “I’d love to have a ‘pretty’ Christmas tree, but we can’t, because we use our family ornaments.” I believe that you can make your tree look show-stopping, classy, and gorgeous and still incorporate your sentimental popsicle stick ornaments. Think outside of the box. 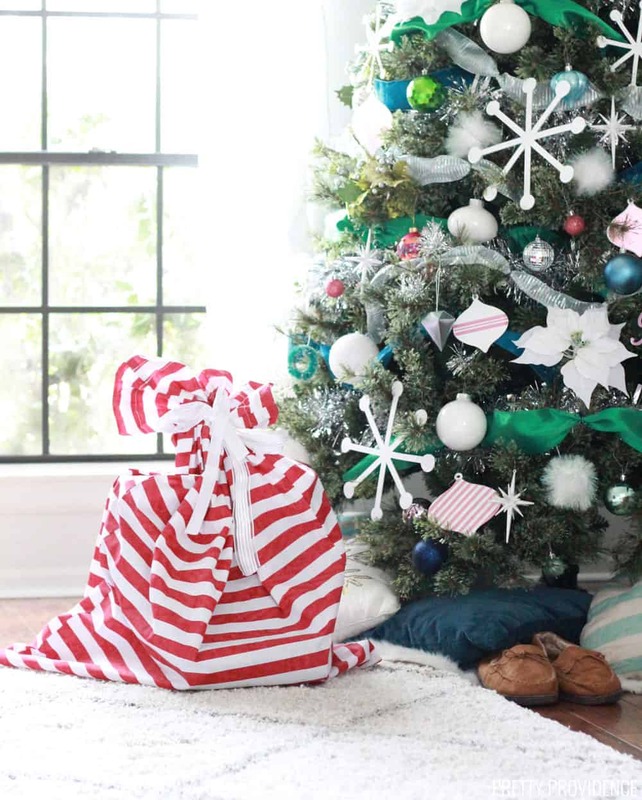 Use ribbon, garlands and big floral ornaments or picks and sprays to dress up your tree. 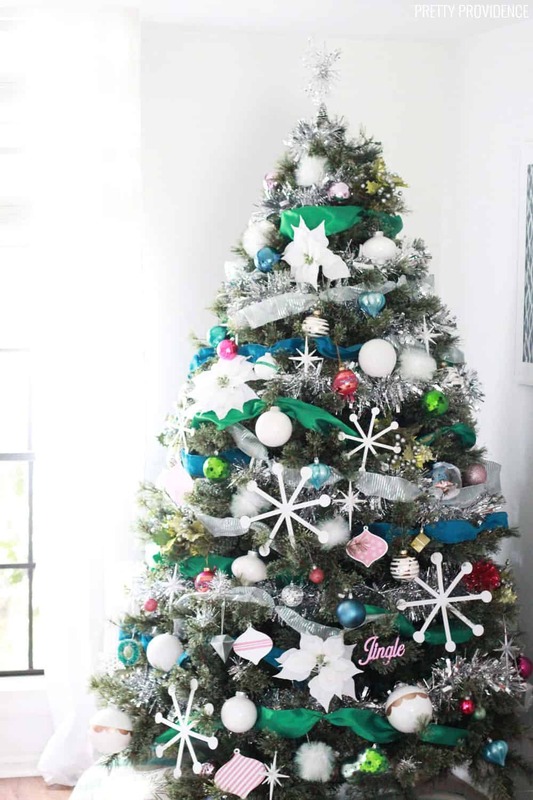 Pick a few colors of shatterproof ornaments to use as a base color scheme. Then add your family heirlooms and pre-school photo ornaments to the tree. You can have the best of both worlds! I know that this tree is kind of whimsical but I think it’s gorgeous, and my 4-year old helped me put all of the ornaments on the tree. We even have the homemade ornaments on this tree, the ones that she’s made in pre-school and those we’ve made together the past few years. I hope you have found some of these tips to be helpful! Love your tips! Thanks for sharing! Beautiful tree! Love the tips. Thank you so much for the tips! This is really gorgeous! Your tree is gorgeous! Thanks for the tips. I never would have thought of attaching the ribbons with floral wire. Great idea!